Religion and Politics in Bahrain: Where Are All the Islamists in Bahrain? In explaining Saudi Arabia's sudden military intervention in Bahrain a month after demonstrations broke out, many commentators have pointed to the announcement of the "Coalition for a Republic" of Bahrain (consisting of al-Haqq, al-Wafa', and others) as having been the final straw that broke the back of the National Dialogue Initiative offered by Crown Prince Salman. The very name itself, we hear, evoked the spectre of another nearby "Republic"--the Islamic Republic--and signified the radicalization (or takeover by the radicals) of the Bahrain protest movement, leaving the government with little choice but to put its foot down firmly if it wished to avoid another 1979. As King Hamad writes in his Tuesday op-ed, "the legitimate demands of the opposition were hijacked by extremist elements with ties to foreign governments in the region." Yet this argument presupposes that there is a significant proportion of the Bahraini population--presumably the Bahraini Shi'a population--that would consider viable or preferable an Iranian-style regime in Bahrain. And, as we see from my 2009 Bahrain survey results, there is strong evidence to suggest that this is simply not the case. Instead, generally speaking Bahraini Shi'is join Sunnis in rejecting a regime based on or limited to religion. In fact, if anything, it is the Sunnis who report relatively more positive views of these institutional alternatives for their country. Respondents were asked, "I am going to name you some political systems that exist today in some of the countries of the Middle East, and I want to ask what you think about each as a way of governing Bahrain. For each one, would you say it is a very suitable, suitable, somewhat suitable, or not suitable way of governing Bahrain?" A parliamentary system in which nationalist, left-wing, and Islamic political parties all compete in elections. A parliamentary system in which only Islamic political parties compete in elections. A system with a strong state that takes decisions without concern for the results of elections or the view of the opposition. A system governed by Islamic law (الشريعة) in which there are no political parties or elections. ١. نظام برلماني حيث الجمعيات القومية واليسارية واليمينية والإسلامية تتنافس من خلال الانتخابات النيابية. 2. نظام برلماني تتنافس فيه فقط الجمعيات الإسلامية في الانتخابات النيابية. 3. نظام سياسي تتولى فيه الحكم سلطة قوية تأخذ القرارات دون اعتبار لنتائج الانتخابات أو لرأي المعارضة. 4. نظام محكوم بالشريعة الإسلامية بدون وجود انتخابات أو جمعيات سياسية. Indeed, if there are any at all who favor an Islamic political system in Bahrain, they are the (presumably Salafi) Sunni supporters of a Shari'ah-based regime as represented in Figure 1. So if they clearly do not tend to support regimes based on religion, what, then, do Bahrainis want? 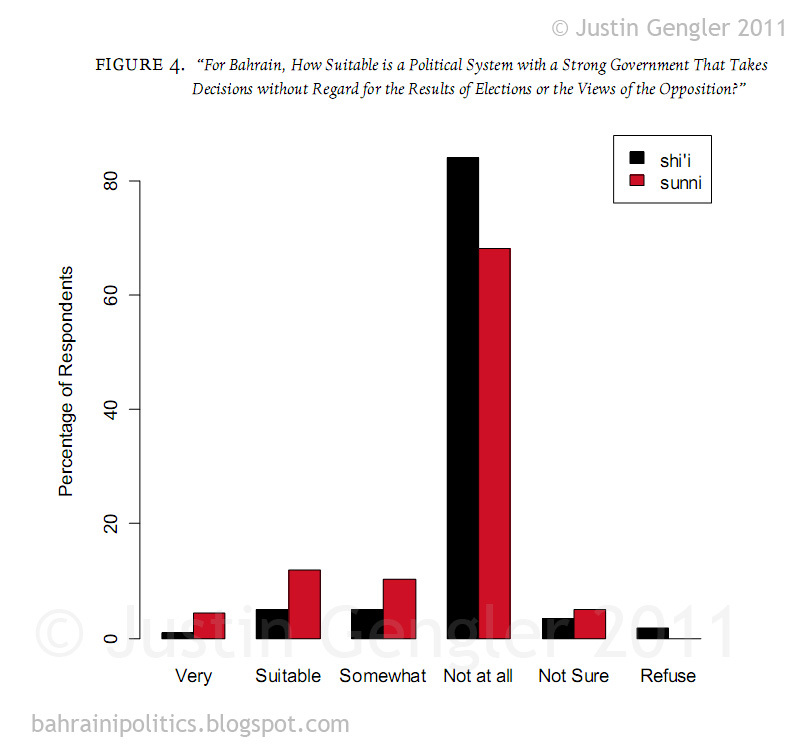 As one might expect, the vast majority of all Bahrainis reject a strong centralized government without elections or opposition. This we find below in Figure 4. Yet while nearly 90% of Shi'a respond that this system is "not at all" suitable for Bahrain, we see that nearly 25% of Sunnis deem it to some degree suitable. One may chalk this up to a desire not to criticize the current regime, but given the proportion of those who do not mind (or do not think of their response as) doing so, this argument is problematic. 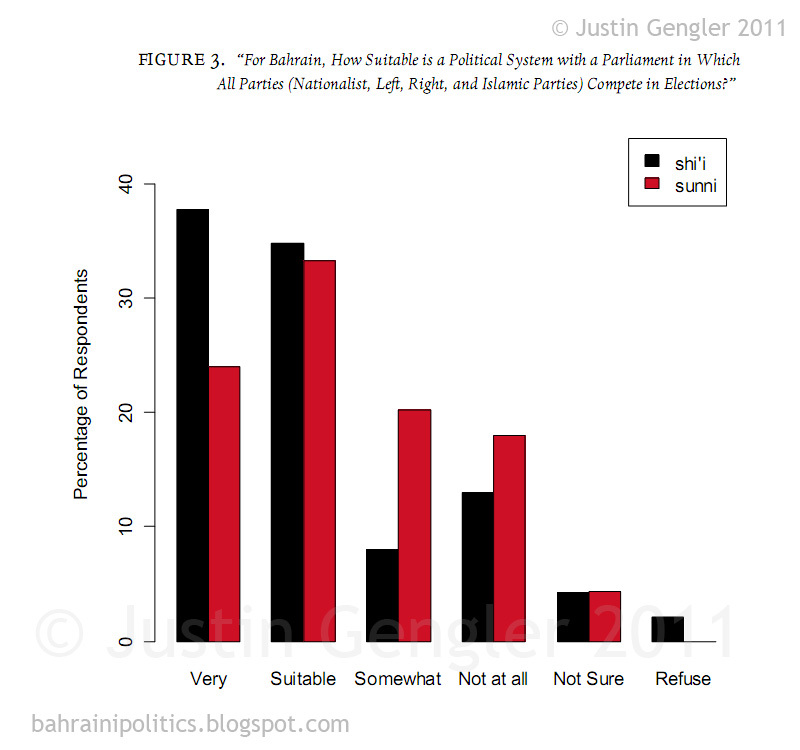 The picture perhaps becomes clearer when we look at Bahrainis' evaluations of the final political system alternative: representative parliamentarianism. These responses are below in Figure 3. 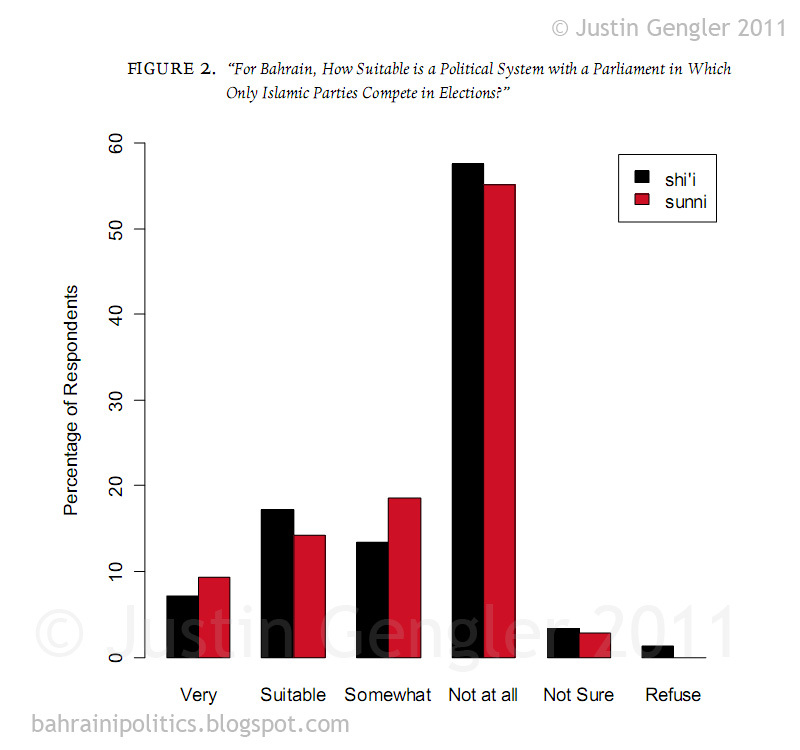 Nearly three-quarters (72%) of Bahraini Shi'a respond that an open parliamentary system is either very suitable or suitable for the country, compared to 57% of Sunnis. While the difference is not immense, it is statistically-significant even after controlling for relevant individual-level factors such as age, education, income, gender, and so on. Yet in the end perhaps this result is not very surprising given which group would stand to benefit most from a free parliamentary system in Bahrain. 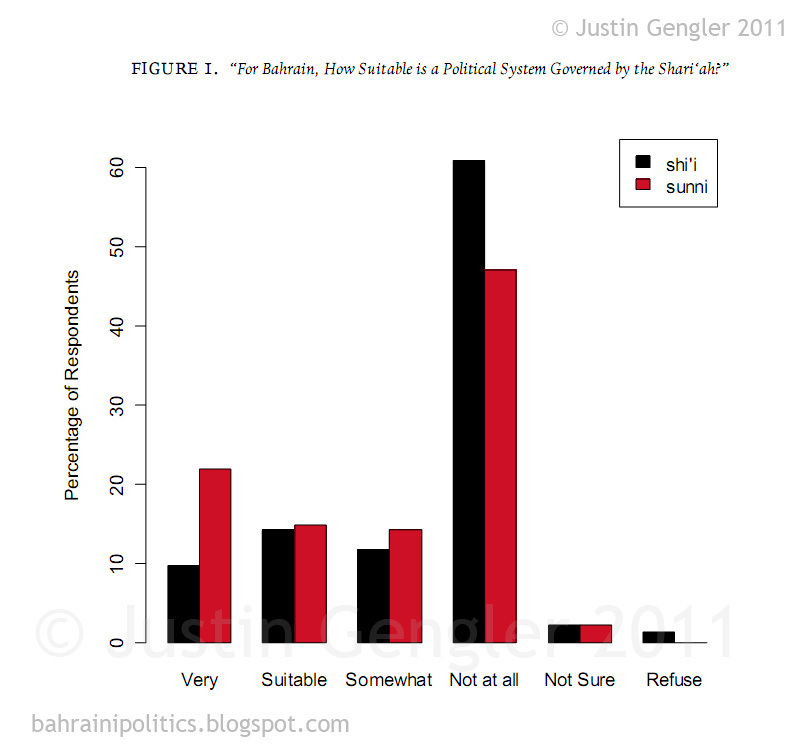 What IS surprising, though, at least when compared to the now-common depiction of Bahraini protesters (and by association Bahraini Shi'a) as seeking to install an Islamic Republic of Bahrain in place of the Al Khalifa family, is the story told by the Bahrain survey data that, in fact, there is relatively little support for an Islamic-based system as compared to an open parliamentary system in Bahrain, and this among Sunna and Shi'a alike. In the end, then, if the Al Khalifa have something to be worried about, it is the strong majority of the Bahraini population--Sunni and Shi'i--that tends to reject authoritarianism and favor instead more political openness. After all, it is not just the Shi'a opposition that has suffered over the past three months but the Sunni opposition as well, as Wa'ad leader Ebrahim Sharif would doubtless attest if he were not currently imprisoned (and according to his daughter being tortured) along with his fellow secularists. And if it really is true (to preempt the question) that these "extremist elements" exist today in 2011 when they did not in early 2009, can there be any question what--or rather who--produced them? Very informative, it serves to dispel the fog of disinformation. You may be interested in visiting my blog (spanish) where I posted a piece on "Bahrain, the achilles´ heel of Saudi Arabia". I'm studying Bahrain in school right now and this is really interesting research. But then do you think that Iran has no influence in some of these Shiite opposition groups?